SAMUI SUITE: A honeymoon room, sweet and romantic room in koh samui. Provides a spacious bedroom with stylish built-in furniture. Open air shower with full bath amenities is provided. The separate living room is the ideal place for a relaxing afternoon tea or a romantic dinner. Mini-bar, tea and coffee making are provided to make your stay more comfortable. HERITAGE SUITE: A cheap accommodation and family comfortable accommodation. Provides superb and fabulous design with a huge living room, 2 spacious bedrooms with flat screen TV & DVD player, a stylish open air bathroom with bathtub and another shower room. Mini-bar, tea and coffee making are provided. The Heritage Suite provides complete privacy and the ideal place to relax in comfort. HERITAGE VILLA: A luxury accommodation. 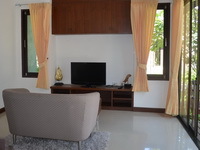 The architecturally designed elegant villa offering a stylish built in furniture. Surrounded by lovely pound environment. Heritage Villa contains a small kitchen counter, tea & coffee making, and mini-bar for your comfortable. Contains two stylish bedrooms with king size bed. Two fabulous bathrooms and shower room. A living room is a fantastic place to relax in front of a flat screen LCD TV. Heritage Villa is a perfectly place for relaxing with family.